We intended to create the image of a crystal – a transparent and clean stone. 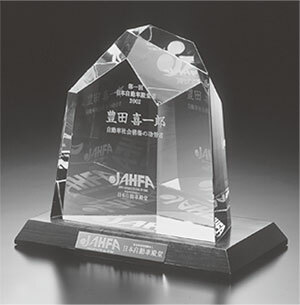 The eternal future of the automotive culture and the valuable career of the Inductees are carved in a space suggesting the Universe – generated by the refractions from the JAHFA logo – thus expressing the limitless future of JAHFA and its work. We intended to create the image of‘wa(’和)-which also means peace or harmony-with natural materials that suggest contentment and comfort both via sight and feel. 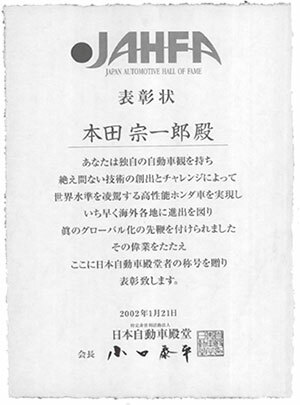 We specially ordered the paper from Kouchi, Japan, and had it made thicker than usual to express excellence. The paper is named‘Ganpi- kanoko’considered to be the best among the three major materials used for Japanesepape‘r:kouzo‘’,mitsumata’and‘ganpi’.Deepgreencharactersprinted on the non-bleached natural color of ganpi hints at our image of Mother Nature. The image derives from the stability of stone columns of the Parthenon in Athens. The‘J’expresses the“Sun Flag”, and the line connecting the two As in‘AHFA’signifies the communication between human beings and their interaction with objects and society, thus expressing the existence of JAHFA in a position gazing past, present and future.